100 helmets traveled through 8 exhibitions, 3 countries and 1 ground breaking auction to live on in a beautiful full-color catalog. The Vader Project is a reimagining of the iconic Darth Vader helmet curated by Dov Kelemer and Sarah Jo Marks of DKE Toys (dketoys.com). Kelemer and Marks gathered close to 100 of the hottest underground and pop surrealist painters, artists, and designers to participate. 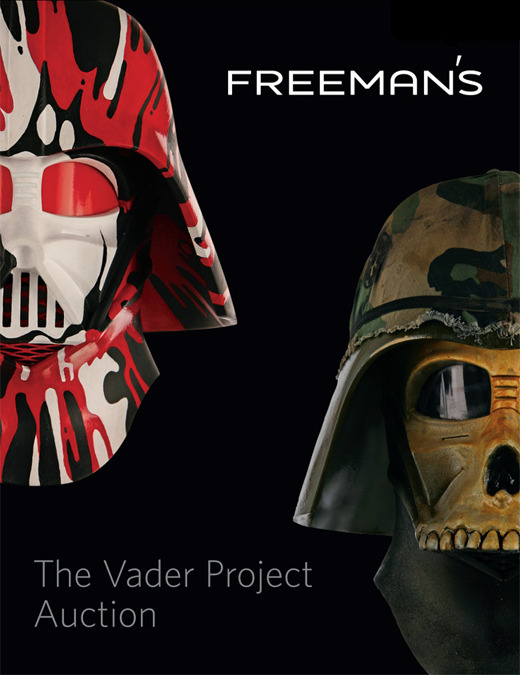 For this unique project each artist was given a 1:1 scale authentic prop replica of the actual Darth Vader helmet used in the STAR WARS™ films. The helmets served as a blank canvas for each artist to paint, design, mash up, and customize. If you are interested in owning a customized Darth Vader helmet from this unique collection, please contact DKE Toys directly at 818-765-3500. Full color, auction catalogs featuring all 100 helmets, artist bios, show info and more are still available.